Hi. It’s Jeni. 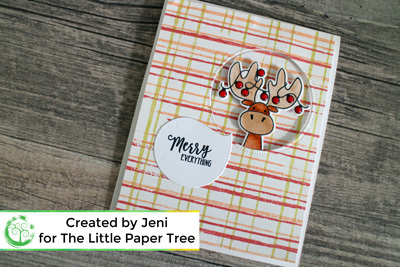 I have a cute Christmas card using non traditional colours and Avery Elle stamp set and dies. I have listed all the products I used at the bottom of this blog post – and again I am sharing a non-interactive card during TLPT Interactive Month but this card is too cute not to share! The background is a left over from another card which I trimmed down to leave a white border on my card. You can see how I stamped it in this video. I have a nice collection of backgrounds that I’ve created that are just waiting to be turned into cards! I stamped the moose and his feet from the Polar Peek A Boo Pals stamp set with black ink onto Bristol card and used Zig Clean Colour Real Brush Markers to colour him in, and diecut him out with the coordinating dies. I diecut the speech bubble from Photo Mat die set after snipping the bow from the middle. From my background panel I diecut the inside circle from the Shaker Tags die that was released last year – also my Avery Elle. This circle die leaves dotted details on the outside of the circle – love this detail! I held the background in place on my card base and adhered the diecut (positive) circle through the gap making sure the pattern matched up. Then used foam squares all over the background so it will be supported and not have any saggy areas. I added the moose with some 3D foam tape making sure his body is tucked under the edge of the circle. Stamped a sentiment (Merry Everything) from the Christmas Magic stamp set onto the speech bubble -adhered this in place near the moose’s mouth and finished the fairy lights around the antlers with Red Nuvo Crystal Drops. Have you noticed something? I forgot to add the feet! I put this card aside for 24 hours to let the Nuvo drops completely dry and took the photographs before I realised. What do you think? Should I add the feet?